✏️ Thomas Hobbes thinks we can gain a fundamental insight into political life if we imagine men and women living in a ‘natural’ condition prior to the invention and institution of the sovereign state. He refers to that pre-civil condition as the ‘state of nature’. For Hobbes the state of nature is an extremely adverse human circumstance in which there is a permanent ‘state of war’ ‘of every man against every man’; in their natural condition every man, woman, and child is endangered by everybody else, life is constantly at risk, and nobody can be confident about his or her security and survival for any reasonable length of time. People are living in constant fear of each other. Hobbes characterizes that pro-civil condition. It is obviously not only desirable but also extremely urgent to escape from those intolerable circumstances at the earliest moment, if that is possible. 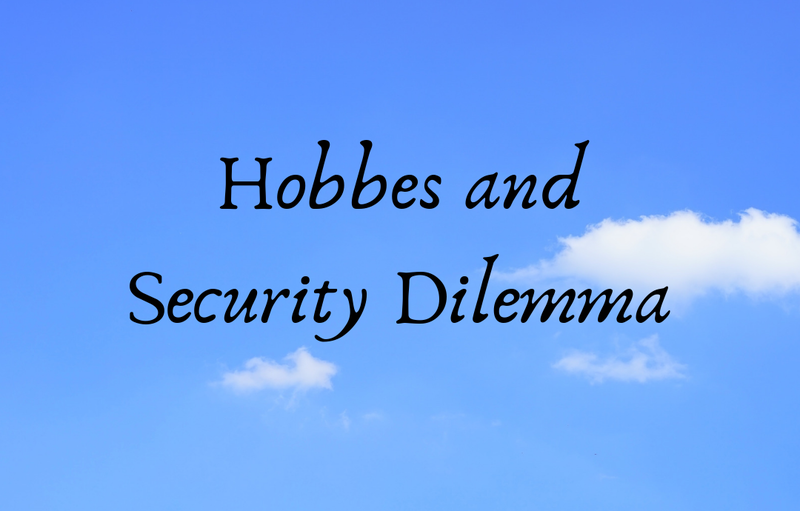 ✏️ Hobbes believes there is an escape route from the state of nature into a civilized human condition, and that is via the creation and maintenance of a sovereign state. The means of escape is by men and women turning their fear of each other into rational joint collaboration with each other to form a security pact that can guarantee each other’s safety. Men and women paradoxically cooperate politically because of their fear of being hurt or killed by their neighbours: they are ‘civilized by fear of death’. Their mutual fear and insecurity drive them away from their natural condition: the war of all against all. In other words, they are basically driven to institute a sovereign state not by their reason (intelligence) but, rather, by their passion (emotion). Their intelligence alone is insufficient to propel such action. With the value of peace and order firmly in mind, they willingly and jointly collaborate to create a state with a sovereign government that possesses absolute authority and credible power to protect them from both internal disorders and foreign enemies and threats. In the civil condition-i.e., of peace and order--under the protection of the state, men and women have an opportunity to flourish in relative safety; they no longer live under the constant threat of injury and fear of death. Being secure and at peace, they are now free to prosper. As Hobbes puts it, they can pursue and enjoy ‘felicity’, i.e., happiness, well-being. Very act of instituting a sovereign state to escape from the fearful state of nature among individual people simultaneously creates another state of nature between states. That poses what is usually referred to as ‘the security dilemma’ in world politics: the achievement of personal security and domestic security through the creation of a state is necessarily accompanied by the condition of national and international insecurity that is rooted in the anarchy of the state system. ✏️ There is no escape from the international security dilemma in the way that there is an escape from the personal security dilemma, because there is no possibility of forming a global state or world government. The main point about the international state of nature is that it is a condition of actual or potential war; there can be no permanent or guaranteed peace between sovereign states, no international peace. But there can be domestic peace-peace within the framework of the sovereign state-and the opportunities that only civil peace can provide for men and women to enjoy felicity. The state is organized and equipped for war in order to provide domestic peace for its subjects or citizens. Domestic peace can be realized in this way. International peace is an unrealizable dream and a dangerous illusion. 1⃣ First, they agree that the human condition is a condition of insecurity and conflict that must be addressed and dealt with. 2⃣ Second, they agree that there is a body of political knowledge, or wisdom, to deal with the problem of security, and each of them tries to identify the keys to it. *⃣ Finally, they agree that there is no final escape from this human condition, which is a permanent feature of human life. ✏️ In other words, although there is a body of political wisdom-which can be identified and stated in the form of political maxims-there are no permanent or final solutions to the problems of politics-including international politics. There can be no enduring peace between states. This pessimistic and unhopeful view is at the heart of the IR theory of the leading classical realist of the twentieth century, Hans J. Morgenthau.